but that's not what this is about. I recently gave in and purchased a pair of oxfords (of the shoe variety, not a spot in a river where oxen...ford...nevermind). 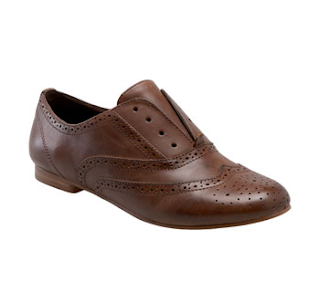 I selected the Steve Madden 'Trouser' Laceless Oxford in brown. Typically, my shoe selections tend more toward the ballet flat genre, for their simplicity and versatility (not their arch support), but I thought it might be nice to change things up a bit. I was a bit apprehensive about the fit because, in addition to the fact that I have large feet (size 10), I also have disturbingly wide feet. Steve Madden shoes tend to run on the narrow side, although their boots seem to fit me perfectly, so I was pleased to find that these classy kicks fit perfectly. Casual without the laces, they'll be a nice change of pace when more hospitable weather roles around and I can break out spring clothes. 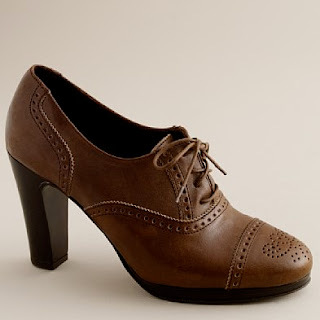 love those j. crew shoes, its one of my favorite stores. I ended up with the Steve Madden oxfords! Great picks. Loving this look right now!